In line with the theme of "sitting," we made the seat soft enough to prevent the buttocks from pain, with the weight to be supported by the buttocks as opposed to the crotch area. AEROELASTIC Company's "EYES Saddle," with two partitioned seats and a saddle nose positioned at a lower level, enables cyclists to ride for longer distances without experiencing physical discomfort. 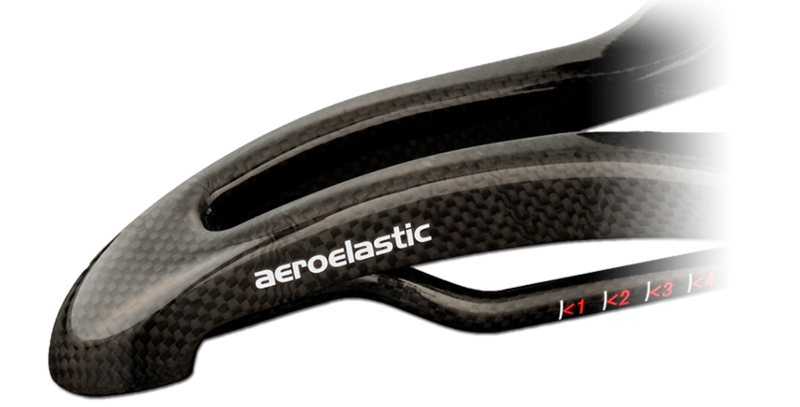 The saddle body and rails are made entirely with 100% carbon-fiber- reinforced plastic that is lightweight with high-rigidity. (No metal is used whatsoever.) The point of the saddle nose has been tapered forwards to prevent catching when mounting and dismounting the bicycle. The video on the right shows that in the European Conformance Test (EN Test), the product passed the vibration test 200,000 times with a load of 120kg. The two separate seats on left and right are tilted forward 20 degrees, thereby providing the widest seat dimensions for road bike specifications. The cushion has a double-layered structure, with the top layer having 30mm thick low resilience urethane foam, providing comfortable cushioning. The bottom layer is made with15mm thick flexible urethane, ensuring stability in the seat.